Power Over Parkinson’s 2 premiered on CPTV on Thursday, March 28, 2019, and is now available to stream on-demand above. This new half-hour documentary explores a range of new approaches aimed at decreasing the impact of Parkinson’s disease symptoms and improving the day-to-day lives of people with Parkinson’s (PwPs). Viewers meet patients, doctors, and other experts who discuss the complementary therapies being studied and implemented into patients’ everyday lives, and the potential benefits of integrative treatment programs that address both mind and body. 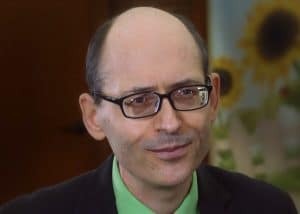 Dr. Michael Greger, author of the bestselling book How Not to Die, explains diet recommendations for people with Parkinson’s (PwPs) in Power Over Parkinson’s 2. Visit Hartford Hospital’s Chase Family Movement Disorders Center, where Dr. Eric Secor, chief of integrative medicine, participates in a monthly meeting where representatives from different medical disciplines discuss patient-centered care plans. Later, Dr. Michael Greger (author of the bestselling book How Not to Die) outlines surprising nutritional guidelines specifically tailored to people with Parkinson’s. The documentary also follows two patients with Parkinson’s who are exploring complementary therapies for the first time: meditation and vibroacoustic sound therapy. Don’t miss this moving and informative journey!